The Recurring Events sub-group within the "Other Settings" panel will define how your customers use the recurring events feature. This sub-group remains hidden until the recurring event module setting has been turned on in the Scheduling category. 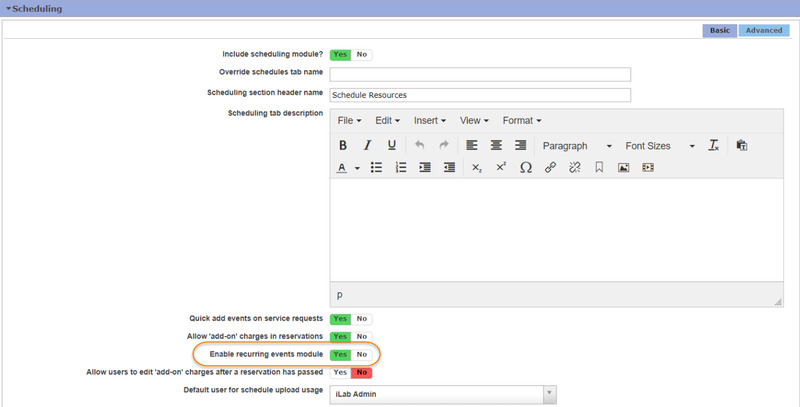 First, within the Scheduling, set the 'Enable recurring events module' setting to Yes. Click 'Apply' and refresh your page. A new sub-group labeled 'Recurring events' will now display directly below the Scheduling category. Completing this section allows administrators to have more control over how and by whom recurring events are scheduled. Maximum number of events within one recurrence: Define the maximum amount of recurring events that can be scheduled through a single reservation. Allow users to create recurring events: Define this field as YES if you would like users to be able to schedule recurring events on resource calendars. Allow only specially assigned users to create recurring events: If the above setting to 'Allow users to create recurring events' is set to YES, core administrators can restrict the users who have access to schedule recurring reservations. Define this field to NO if you are allowing all users to create recurring events. Define this field as YES if you would like only specific users to schedule recurring events. Users are managed per calendar. Refer to the Recurring Events section of the Schedule Settings‍ article for more information on managing users who can create recurring events.